Hey guys! I turned in the edits for Autumn Republic on Monday! And that means that every sentence this week will end in an exclamation point! Yay! Okay, that's enough of that. Book three edits are turned in, about which I'm extremely happy. The next step is going to be copy edits. I'm not quite sure when I'll be getting those back, so to fill the time I'm going to work on another bit of Powder Mage short fiction. My plan is for this to be a novella that starts off about where Forsworn ends, picking up with Tamas' point of view. I've got most of the novella outlined and I hope to start writing it either today or tomorrow. The working title is Servant of the Crown. Other than that, not much going on. I got most of my garden in yesterday. I ordered a new package of bees to start a second honeybee hive because the first one isn't doing so hot and it's going to take all summer to nurse it back to health. I'm over on Tor.com's Rocket Talk podcast chatting with Delilah Dawson and Justin Landon about genre terms, short fiction, and all sorts of other fun stuff. More reviews are coming in for Crimson Campaign. They are predominantly positive, which delights me to no end. Right now all the Amazon reviews are either 4 or 5 star, although I'm sure that will change sooner or later. Over on SFF World, Rob Bedford compares the writing to both Joe Abercrombie and Glen Cook, which I'm sure does the both of them great disservice. Most of you know that I sell signed copies of Promise of Blood through my website. I had held off selling copies of Crimson Campaign myself for a couple of reasons, but in light of this whole Amazon-Hachette kerfuffle and the uncertainty and unreliability of getting the hardcover from Amazon, I've decided to go ahead and put them up. To start off I'll have some US and UK hardcovers as well as some C-Format paperbacks. The sales will be via Paypal and include media mail shipping. You can get them by clicking here. Don't have Paypal? You can get signed copies of Crimson Campaign from Goldsboro (UK), VJ Books (US), or order one directly from my local Barnes and Noble (US). I have twenty free download codes from Audible.com for the audiobook of my Powder Mage short story "Hope's End." I've been trying to figure out how the heck to use them and I finally have it! To celebrate this week's launch of The Crimson Campaign, I'll be giving away those twenty free "Hope's End" download codes to the first twenty people who send me a picture of The Crimson Campaign on the shelves of their local bookstore. You can tweet it to me, tag me on Facebook, or email it to brian (at) brianmcclellan (dot) com. Be sure to include the name and location of the store! If you Twitter/Facebook it, send me an email to make sure I noted your entry! The official launch date of The Crimson Campaign is May 6th (tomorrow) but there have been several reports of it being on shelves already. Get out there and find it! I'll be posting the pictures as well as their locations as they come in. A few items that may interest you all as we grow nearer to the launch of The Crimson Campaign. I apologize in advance for the slew of links. First, to celebrate my book launch the Powder Mage short story "The Girl of Hrusch Avenue" is a free download over on A Dribble of Ink for the next ten days. You can head over and check that out if you'd like. Second, there's an interview up over on SFF World where Rob Bedford asks me about my writing process, distractions, and Muppets. For those of you in the Cleveland area, the book launch party for Crimson Campaign will be held at the Barnes and Noble in Mentor on Saturday, May 10th from 1-3PM. Hope to see you there. Lastly, but not least, Orbit Books will be hosting a Google Hangout tomorrow (May 1st) with yours truly and rockstar epic fantasy author Brandon Sanderson. Don't worry if you miss it, because the Hangout will go on Youtube afterwards and you'll be able to thoroughly examine me tripping over my own words again and again. I have picked the winner of last week's review contest for an early copy of The Crimson Campaign. Congratulations to Jason Montgomery for his review of Daniel Abraham's Long Price Quartet (a series that I also greatly enjoyed). Jason, I'll put your book in the mail in the next day or two and send you a tracking number. Thank you everyone else for your entries. They were varied and fun with a ton of reviews for Brandon Sanderson, Robert Jordan, Fargo (TV show), Game of Thrones (TV show), Winter Soldier, and Daniel Abraham. The contest had 208 entries. Really fantastic. You can still try to win a copy of my next book by jumping over to Goodreads, where Orbit is giving away five copies within the US, Canada, and Great Britain. You can pre-order The Crimson Campaign anywhere fine books are sold. We all know that sales are good for an author. I mean, of course we do. Sales get money to the bookstores, the bookstores pay the publisher, the publisher pays the author. Or in the case of self-pubbed authors, sales get money to the distribution channel (Amazon, Kobo, etc) and then the distribution channel pays the author. The former is how it works for my Powder Mage novels. The latter is how it works for my Powder Mage short fiction. How those two benefit me in different ways is a whole new blog post. Some of you know that my second book, The Crimson Campaign, is coming out in two weeks. That means that sales are on my mind a bit lately. What most people don't know, and what I certainly didn't know before getting into the industry, is that even with all other things being equal some sales are more important than others. Pre-orders land in this "more important" category. These are any purchases made before the official release date of a book and can be made for ebooks, hard copies, and sometimes (but not always) audiobooks from major publishers. Why are pre-orders important? The most obvious reason would be bestseller lists. Pre-orders count toward first week sales that often determine whether a book winds up on a bestselling list, a possibility that can be huge for any author. Aside: first week sales also land in the "more important sales" category for this same reason. Pre-orders also affect what happens behind the scenes. A large number of pre-orders can cause a vendor (Amazon, Barnes and Noble, Books-a-Million) to go back to my publisher and ask for another order of books. That's before the book is even out. How cool is that? That order could be 200. It could be 2000. Doesn't matter how small it is, another order is fantastic. In addition, notes will be made about how well these books seem to be selling. My publisher can go to their other vendors and say "Hey, X just ordered another 300 copies of Y, which means you'll probably have a high demand as well. Can we send you more?" It's a snowball effect. It can cause sales to grow and as we established before, sales are good for an author. And remember that we're still only talking about pre-orders. The book hasn't hit shelves yet and it's already gotten both booksellers and publishers excited for it, and when booksellers and publishers get excited about a book they will push it all the more to the book-buying public. If one or more vendors order more books this can cause a novel to get a large first printing or to go back to a second printing. This means that the book has sold better than expected even before it comes out and guess what? Both publishers and booksellers take note of this as well. I was told last week that The Crimson Campaign has already gone to a second printing, and I walked around all day with a grin on my face. All of these facets spin together to make pre-orders a huge part of the business. They're good for bookstores, publishers, and most especially for the authors whose living depends on their books selling well. If you have an author whose book you're planning on buying and you can afford to put the money down ahead of time, please pre-order their book. This could be one of my books or books by any author you would like to give an extra boost. Here are the books that I've pre-ordered this summer: Sworn in Steel by Douglas Hulick, The Fifth Season by NK Jemisin, City Stained Red by Sam Sykes, and The Shadow Throne by Django Wexler. If you want to read a bit more about this, Kevin Hearne talks about pre-orders over on his site as well! I have gotten my author copies of The Crimson Campaign, which means it's time for a contest! I'm giving away one signed C-format copy (this is the large paperback sold by the UK to other countries). Entering is very straight-forward: Fill out the Google docs form here or below. CONTEST OVER. If you haven't read book one, Promise of Blood, you can see what it's all about here. This is an international contest. The contest will go until sometime next week or until I'm sick of hearing from you all. Three hundred and sixty five days ago, Promise of Blood hit shelves worldwide. I still have a hard time getting my head around it. My first novel. My book, something that came out of my brain, was released into a thousand or more bookstores all across the globe. It attracted some really great reviews (and some crumby ones). It was blurbed by multiple New York Times Bestselling authors. It broke the top ten in Fantasy on Amazon on several occasions. It did quite well. Far beyond my expectations. I had help, of course. No matter what even the most successful self-published author will tell you, this kind of thing isn't accomplished alone. My agent, editor, cover artist, and all the staff at Orbit. My wife and beta readers. If I've achieved any level of success it's because of these people just as much as it is any effort of my own. I continue to learn something new every day. I try to keep up with the industry, equipping myself to navigate the ins and outs of that crazy thing we call publishing. And it is crazy. Parts of the business still run like they did a hundred years ago which is absolutely nuts if you think about it. That's a whole blog post (or twenty) all on its own. I've gotten two royalty statements now and I can only make sense of about 60% of them which, from what I can gather, is the norm. I've made dozens of new friends in the industry. I've met my heroes and found out that they're just regular people (who write incredible books). I've learned that neurosis describes most authors and not just me. I had this fear, and still do from time to time, that I'm a great big phony and that everyone will figure that out and my subsequent books will tank and no one will like me. Then I found out that "Impostor Syndrome" is a thing and just about every author has experienced it to some degree. During this last year The Crimson Campaign, my second book, went through copy edits and production and will be out in just three weeks. It would have been out in February if Promise of Blood hadn't done so well that Orbit wanted time to give it an extra push. That extra push was successful, by the way, if pre-orders are any indication. The Crimson Campaign has already gone back to a second printing. I wrote book three, The Autumn Republic. The first draft was accepted and I'm working on edits. I signed a contract for three more books in the Powder Mage Universe, locking me into this world for another four years or more. I find that to be almost as amazing as the fact that I've written three whole novels now. I also wrote and self-published three pieces of Powder Mage short fiction (two short stories and a novella), which people really seem to enjoy. I plan to do several more of those this coming summer. So that's the last 365 days. It probably sounds like another round of self-congratulatory back-patting. It is. I spend enough days staring at the computer, locked in my office, getting nothing done and wondering what I'm doing with my life that sometimes I need to remind myself that I actually have a job where I'm supporting my family and accomplishing things. Even if people only see the fruits of my labor once every year or so. That might sound a little dark, but I really do love this job. I'm grateful to all the awesome people who buy my books and allow me to keep pursuing my dream every day. Thank you. And I hope you all enjoy The Crimson Campaign. Got this in the mail today. Woo! Hey guys! 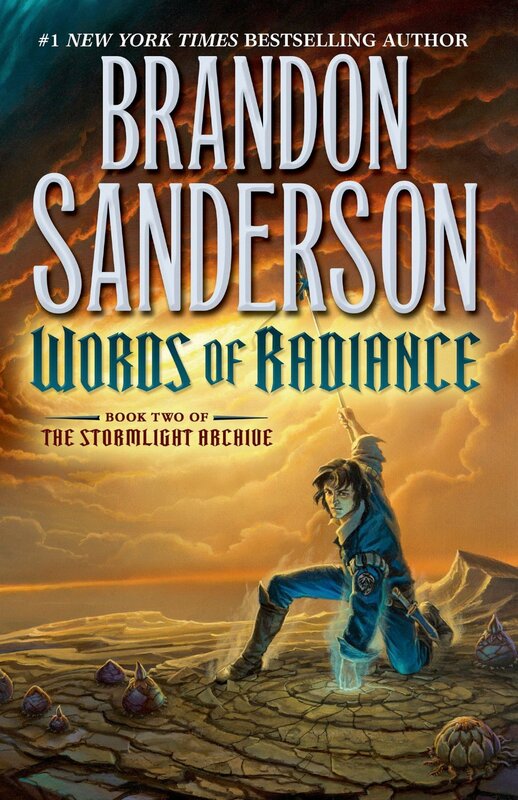 I'm delighted to announce that I'll be joining Brandon Sanderson, author of Words of Radiance, the Mistborn Books, co-author of the last three Wheel of Time books and all around cool author guy for a Google Hangout on May 1st. We'll talk about our new books, writing as a career, genre fiction, and take questions from the audience. I think it'll be an absolute blast and hope you all can make it. Follow this link here to find Google Hangout. Pre-order The Crimson Campaign and get a signed bookplate! We're now just five weeks away from the release of book two in the Powder Mage Trilogy, The Crimson Campaign, and Orbit Books is giving away a little swag to those who pre-order. In case you don't know, bookplates are large stickers that you can put on the title page of a book. This is great way for your to get your book signed in absentia and the map art from TCC used on them is gorgeous to boot. Heck, they're so pretty that I kept one for myself when I was signing the giant stack (shh, don't tell my publisher). For my local friends and readers: I now have a time and date for the Crimson Campaign launch party! It's going to be on May 10th, 1-3PM, at the Barnes and Noble in Mentor, OH. There will be copies of both Promise of Blood and The Crimson Campaign available for purchase. There is also likely to be punch and cake because, come on. It's me. If you're a Facebook kind of person, you can add the event to your calendar here. Hope to see everyone there! Or, you know, just three awesome covers. The first review of The Crimson Campaign is out! You can read it here on Kirkus. They say "A reliably rewarding installment that will keep appetites whetted for the conclusion." I can live with that. If you haven't pre-ordered The Crimson Campaign yet, you can do so on Amazon, B&N, Amazon.co.uk, Waterstones and more. Pre-orders are huge for a new author like me, so I'll be very appreciative! The UK paperback of Promise of Blood is out today! And there was much rejoicing! Huzzah! You can get it from Amazon, Waterstones, and your local bookstore. It looks like it's also available in Australia. If you're looking for a signed copy of the hardcover, looks like VJ Books still has them in stock. If you want something a little more interesting, there is one signed, lined, and dated copy left at Doodled Books. For those of you in the US, the trade paperback won't be out until April 8th, but you can pre-order it on Amazon or B&N. In the meantime, don't forget to pre-order The Crimson Campaign, or grab one of the Powder Mage short stories. As consolation for the delay of The Crimson Campaign, I've been working on a new Powder Mage novella that I hope to release by the beginning of February. This one takes place many decades before the events in Promise of Blood and features someone we have not met before: Erika, Field Marshal Tamas' wife. Hey everyone. There's some bad news in the Powder Mage universe today. As some of you may have noticed when Amazon changed the release date yesterday, The Crimson Campaign has been delayed. It has been pushed back from February 18th, 2014 to May 6th, 2014; a delay of about two and a half months. Let me assure you that I'm just as disappointed as you are. Release dates have quickly become the major milestones in my life (this being my full time job) and changing one of them has a pretty huge effect on me psychologically. That being said, my publisher has decided that a May release would be so much better in order to put The Crimson Campaign into has many hands as possible. I completely trust their decision in this matter. They've done such an awesome job with my books so far, I don't think they're going to let me down now. You may be grumbling that it sounds like a marketing decision and wondering why this matters to you. It is, and it does: the better The Crimson Campaign (and subsequent books) does in the bookstores, the better I will do as an author, which will allow me to focus on writing and not, say, go find a full time job doing something else. This means that you'll continue getting a Powder Mage book every year for the next four years after this one, rather than me having to spread out the release dates because I don't have as much time to write. This also effects the release of the Promise of Blood trade paperback. Orbit will push that release back to April 8th in the US. The UK release will stay the same (January 18th). Yes, the trade paperbacks are already printed. They are pushing this back so that the TP of Promise of Blood and the hardcover of The Crimson Campaign are in the bookstore at the same time (new releases generally only spend 3-4 months in the bookstore). I know this all amounts to a big pile of having to wait for all of you guys. I'm sorry about that. To help ease the waiting a bit, I'm going to fast track a couple of story ideas I have and put out more Powder Mage short stories this winter. The first of these will introduce us to Erika, the wife of Field Marshal Tamas. Sorry to let you down, and I hope you all have a safe and happy holiday season! That work is just superb. I love that Isaac designed them to look like a map you might find in the early 1800's. I love the borders and the details and, well, everything about them. When we got to The Crimson Campaign, my editor asked me if we needed any additional maps and I asked if I could have Isaac edit two of the maps (with new locations) for book two, and create one new one. And she said that would be great! So what I'm going to do now is show you the edited Adro map that you'll find in The Crimson Campaign. As a warning, it does contain spoilers (if you examine it closely) for Promise of Blood. The Crimson Campaign is due out February 18th, 2014. Pre-orders are open on Amazon, Barnes and Noble, and wherever fine books are sold.